And so we made The Star Seekers — an interactive space adventure for 3–8 year olds — in a room above a pub in Bristol. We spent days drawing stars onto walls and going round skips to find things to build the set with. We had one moment where all the audience “entered space” by walking through a shimmering curtain into another room. Some of us had made and been in kids’ shows before, some of us hadn’t, all we knew was that we wanted the kids to be at the heart of our show. We did not want them to be passive receivers but rather active participants. And so we tested the boundaries of interactive moments; can a child contribute an idea to a song which then needs to be rhymed by one of the actors? Yes they can, even when that word is completely made up or technically impossible to rhyme (hello oranges!) 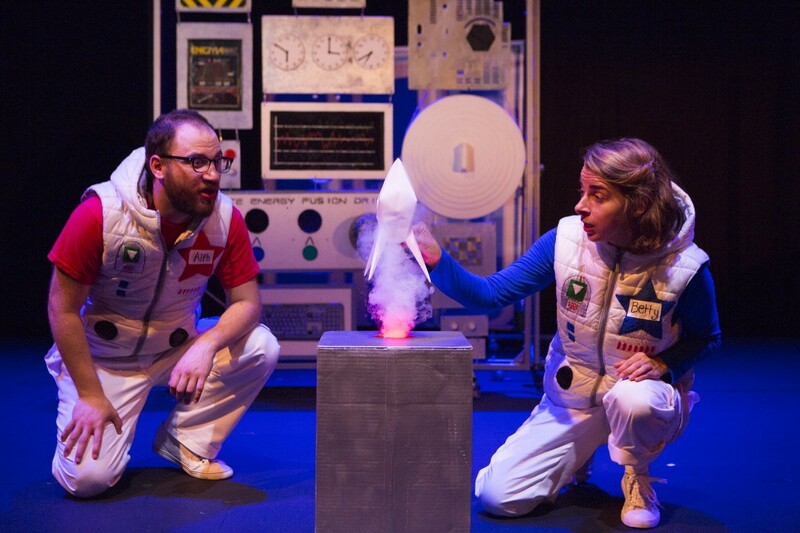 Can the kids throw paper asteroids at the stage without totally losing the plot and getting swept up in the excitement? Well the throwing was the easy part, getting them to calm down took a bit of working out. Essentially, the question we ask ourselves when we make this work, is how much interaction is too much? And can we set the parameters so that it feels structured whilst genuinely incorporating the kids’ ideas? We have now toured The Star Seekers and its follow up show The Time Seekers all over the country, in schools, festivals, theatres and town halls. I directed the shows but I am also the technician and so I have seen these shows hundreds of times and genuinely, each show is joyful because it is always original. That is because of the kids in the audience. I’ve seen a dinosaur playing hide and seek, I’ve seen an alien made of pants digging up rocks on its planet to find ice cream, I’ve seen an audience perform surgery on a black hole. It is hard now to imagine making work for this age group that doesn’t involve them playing an active part in it. As a side note, after much debate we also said ‘yes’ to taking The Star Seekers to Edinburgh in 2017 to play alongside our full company adult show Education Education Education. Whilst EEE was selling out, we were really struggling to get an audience to come to TSS, as the competition was large, established, known-title children’s shows. We were, however, buoyed along by audience members like Niamh, a four year old star seeker who came to the show 3 days in a row. Whilst the rest of The Wardrobe Ensemble were collecting our Fringe First award for EEE, we performed The Star Seekers to 6 people, of which only 2 were children, but amongst those watching was someone from the outreach department at the National Theatre. 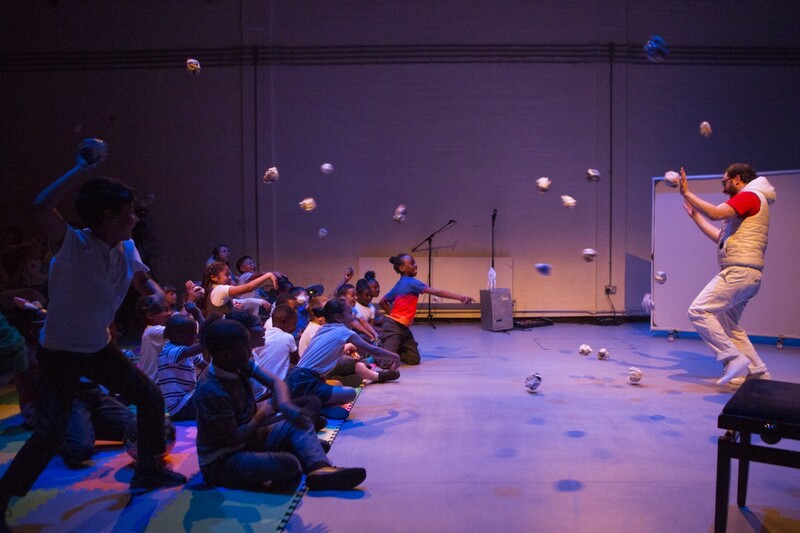 The show then got programmed to play for a month at the Dorfman in summer 2018. You never know what might lead to what. All we knew is that we had created a show that we loved to perform and that kids like Niamh really seemed to respond positively to. We are now making our third seekers show — The Deep Sea Seekers — and our challenge is to come up with new ways in which we can invite our audiences to contribute. Mostly this involves us having a big old play, channeling our inner 5 year old and seeing what makes us laugh, but we also always take a work-in-progress version of the show into a local school to try it in front of kids, that’s the true litmus test to see what will fly and what will flop and it’s always one of the highlights of our rehearsal process. I take a lot of pride in the fact that we make work for both youngers years and for adults. It is so common for work for kids to be perceived as being secondary, or lesser, but in my experience they are the toughest and most honest critics you’ll ever get, and you have to interrogate the work with as much vigor you would any show for adults. Plus, the work sparks a whole lot of joy.